Cupcakes 'n Daisies: Just Another . . . . .
until he got to this point.....he'd spotted a turtle racing across our yard. We have a pond in the back, I'm not sure where this turtle had been, but he was ready for a swim, until Cooper spotted him. This was as close as Cooper would get, which in my opinion, was just close enough. After torturing the turtle for a few minutes, we picked it up and placed it next to the water. It was gone before I even turned around. How's the corn looking in your neck of the woods? I went to the Farmers Market on Friday to find several local farmers with their flatbed trucks filled with corn, picked that morning. Our first fresh corn on the cob of the season. It was the best corn I'd EVER had. I've heard, with our record rain this year, we're in for a bin buster corn crop. I know nothing of corn yields, I only know I can't get enough of this corn! Carrie Nelson's American Pie pattern? I'm still at it and thankfully still loving that Fig Tree fabric. I started out just making blocks and throwing them on my design wall. Once I got several up, I noticed, that since the border was narrow, the lattice work didn't pop like I had hoped. I'm now matching like colors (not fabric) in each diagonal, it's doing the trick. It now has the lattice look and feel that I was going for. The downside is that I have to make one block at a time, to ensure I get the right color combinations. So it's sloooooow going. I'm not even half way done yet! But I'm sticking with it. I know one thing for sure, my next project, whatever it may be, will not be KING SIZE! Two king size tops in a row was not good planning. That is too funny... the turtle was really racing?? Great photos of Cooper with his new found friend though. The corn is wonderful here. I just love that about the summer too. Your borders are turning out just wonderful on the quilt!! Your basket quilt is going to be gorgeous! OMG the picture of Cooper investigating that turtle was priceless! I laughed out loud. Your American Pie quilt is going to be incredible. The phot of Cooper and the turtle was very cute...it brings back memories of my precious Sydney investagating a goose that wandered in our yard! The corn looked wonderful! We have been eatingas much as we can while it's here! Cooper reminds me of our dog many years ago when we lived out in the country. He circled and barked at a turtle for so long DH had to take the poor thing down the road and release it near a small stream. That corn looks like "Peaches & Cream" variety, the best I've ever eaten. The lattice is looking good with the baskets, it will be very pretty! The pictures of Cooper and the turtle are so cute! And I think the lattice is wonderful with the baskets. You're always a source of inspiration. I know one turtle that is very happy you were there! Your corn does look yummy, we are left to purchase from the grocery store, and it's not nearly as good as off the truck, fresh from the fields. Love the pics of Cooper and the turtle. YOur basket quilt is looking wonderful. 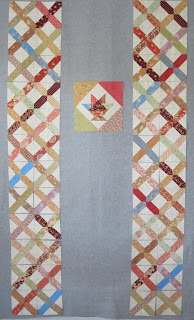 I have done one small pieced border but you inspire me to try something bigger. You know how much I love this border you're doing. It's stunning and will be worth all your hard work in the end. You know what they say - Go Big or Go Home!